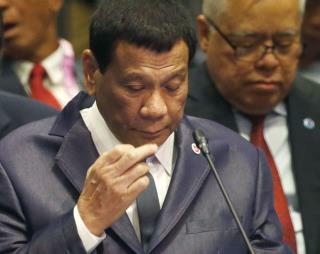 President Rodrigo Duterte has waged a controversially bloody war on drug dealers in the Philippines, but that didn't stop the leader from cracking wise Monday about his own use of illicit substances. Per Reuters, Duterte said in a speech that he used marijuana to stay awake at the Association of Southeast Asian Nations, which he attended in Singapore last month. After the comment caused a stir, Duterte clarified that he was merely kidding. seems like more of a meth head. One can only hope his tailor is in jail. Philippines Idiocracy: "Let Duterte be Duterte". Another Trump corrupt dictator bestie.